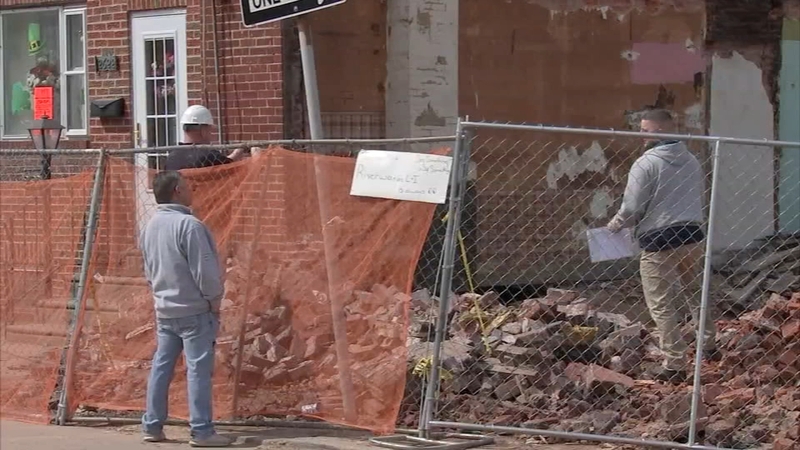 Philadelphia home in jeopardy after faulty construction collapses after heavy rain as reported by Dann Cuellar during Action News at 11 on March 21, 2019. PHILADELPHIA (WPVI) -- A family awaiting on an engineer's report to see if their Fishtown home could be salvaged, now knows it must be demolished after Thursday's heavy rains caused the building to further collapse. The home at 2622 Tulip Street had the misfortune of being next door to a row home where officials say a contractor accidentally breached a load bearing wall. While the owner of the home was too upset to talk, neighbors gave their thoughts. "It just felt like a rumble. Sort of what we had a few years back when we had a mini-earthquake," " said neighbor Rich Kelly. "And I had a feeling it was going to happen cause we knew the rain was coming today," added Fishtown resident Valerie Capasso. A family in the Fishtown section of Philadelphia is waiting to find out the fate of their family home of more than 50 years. Family friend Nancy Clipner said, "The father is in a nursing home and the mother just passed away not too long ago." The only saving grace was four construction workers who risked their lives to go into the badly damaged home to try and retrieve whatever belongings they could for the family. "They were so happy when they got all those belongings and they took them out of there and was able to salvage something out of it. I thought that was the best part of the day, made a bad thing good, you know what I mean?" Kelly said. Family home in jeopardy after faulty construction next door in Fishtown. John Rawlins reports during Action News at 5 p.m. on March 20, 2019. Last month, a similar incident occurred a mile away in the 600 block of East Thompson. Poor renovation work in one house triggered a demolition that ended up destroying a second home. Fishtown home to be demolished after unexpectedly sinking a foot. Bob Brooks reports during Action News at noon on February 10, 2019. Residents feel the city needs to do more to address unscrupulous contractors doing shoddy work. "You got these contractors and they hire fly-by-nighters to do it and that's it," said Clipner. Capasso added, "Contractors are coming in, they're not doing things the right way, they're taking short cuts." And Frannie Kelly said, "L&I should go out there and make sure they got their permits and place them on the window, rather than doing this stuff under the table." Mayor Jim Kenney and officials said they continue to be outraged by what they call the negligent construction practices that lead to the collapses and threatened public safety.